Party pioneer-style at at the Northern Manitoba Trappers’ Festival in The Pas! You’ll see brave souls set traps, filet fish, build fires from scratch and even whip up a snack over that open fire. And no trappers’ festival would be complete without an axe-throwing competition, championship dog race and, of course, the coronation of the King and Queen Trappers and a Fur Queen. If you are a newbie to the festival, Shel Zolkewich, has a handy list of tips to make your experience a wonderful one. Put on your felt toque, wrap a sash around your waist, and get ready to celebrate our French-Canadian history at Festival du Voyageur, Western Canada’s largest winter festival! This 10-day event celebrates Canada’s fur trading era and combines the joie de vivre of the Voyageurs with more than 300 music performances, magnificent snow sculptures, historical interpretation of the early 19th century, traditional dishes, arts and crafts, the Torch Light Walk, and a beard growing contest. One of the hottest events of the year, Art & Soul: Clash of the Titans, will take you from the heights of Mount Olympus to the depths of the underworld. Dress as your favourite mythical figure and rub shoulders with other deities and heroes while enjoying non-stop entertainment. All proceeds support the WAG. Feb 20 | Noon to 3:00 p.m.
It’s Family Fun Days this weekend in Spruce Woods Provincial Park! Everyone’s welcome to participate in skating, jam pail curling, snow painting, skiing and snowshoeing (equipment provided), crafts, and scavenger hunts. There will also be sleigh rides! And warm your bellies with FREE hot chocolate, cookies and chili. It’s finally here! 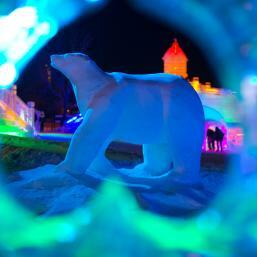 After much anticipation, the Forks has been transformed into an icy wonderland that you have to see to believe. 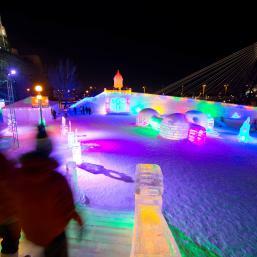 Explore every inch of this artistic achievement and see a wide variety of sculpted animals, a huge toboggan slope, igloos and an enormous ice replica of the Manitoba Legislative Building! There’s something for everyone at The Great Ice Show. 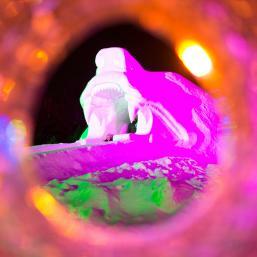 Plus, flying down the ice slide at night feels like you’re in a colourful video game! The 1950’s is the setting for Val Caniparoli’s A Cinderella Story, a retro retelling of everybody’s favourite fairy tale. Experience this unique take complete with vintage couture-inspired costumes, electric choreography melded with Richard Rodgers’ music, all arranged for a live jazz orchestra by legendary Winnipeg bandleader Ron Paley. Photo by Leigh McAdam via Hike Bike Travel. 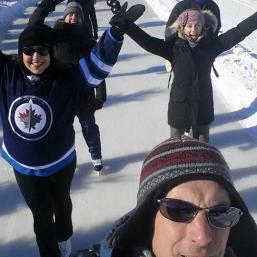 If you haven’t experienced the Whiteshell in winter, it’s time to give it a try. A paradise for nature-lovers, in the park you can glide along cross-country ski trails, get back to nature on horseback, sled over groomed snowmobile trails, wait for the big catch while ice fishing, or break through fresh snow by snowshoe all while keeping your eyes peeled for all sorts of wildlife. Visit Experience The Whiteshell for more information or get a glimpse of what skiing the area is like through the eyes (and skis) of Hike Bike Travel. February is Northern Explorer Month at the Zoo. From February 1 to 29, pay for one regular priced admission then use the same ticket to return to the Zoo as many times as you like for the remainder of the month. A dream is a wish your heart makes. Join your favourite Disney Princesses and enter the magical, musical world of Disney on Ice Presents: Dare to Dream! Classic Disney Princesses such as Cinderella and Snow White will make appearances as well as modern princesses such as Rapunzel and Tiana. Beauty, sparkle and spirit take to the ice in this unforgettable performance that your family will remember forever. Catch the Brandon Wheat Kings take on the Edmonton Oil Kings and Kootenay Ice this week. The Wheat Kings enter the week firmly entrenched in first place in the Eastern Conference. February is the month of love and romance, and the Royal Manitoba Theatre Centre is certainly not shying away from the theme. In Things We Do For Love, Barbara rents out her top floor to an old friend and her fiance and violent passions ensue. It’s a wicked comedy that takes a closer look at the things we do (and wish we didn’t do) for love. Taking a short break. Photo by Yan Cong. We are winter! Photo by Doug Evans. Trail love. Photo by Michel LaRiviere. 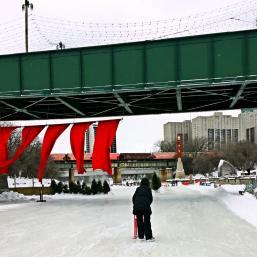 Take in the picturesque sights of Winnipeg as you’ve never seen them before, from the frozen Red River! 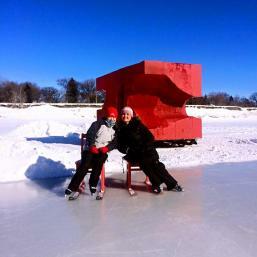 Venture out to The Forks to enjoy a variety of outdoor activities: skating, walking, curling, hockey, family activities, historic interpretation, cycling, broom ball, and much more. Hit the slopes at Asessippi Ski Area and Resort for skiing, snowboarding and downhill snow tubing at Manitoba’s largest ski resort. Follow the cheese. Head out to New Bothwell to enjoy a weekend of fun at their Winter Carnival! Events include a cribbage tournament, pancake breakfast, bingo, hockey, skating, ice scrambles, great food, and fireworks.